It's been a rough week. A really rough week. My mom was diagnosed with breast cancer which has, horrifically, spread to her liver. We're all devastated. But ready to go into battle alongside her. She will survive. I know this. The other night when I cried myself awake, after I had become still, I became intensely aware of the words 'This is not a dance of death'. I'm holding fast to promise I felt in the silence of the night. She starts chemo on Wednesday. We've bought almost R400's worth of ginger sweets and I intend baking rusks this afternoon, from a recipe she's used for as long as I remember. There is something comforting about this robust biscuit. The one we dip into our tea or coffee, the biscuit our teething babies gnaw on, the biscuit that I hope will calm my mother's nausea. Jacques tells me that there is a woman who, every Wednesday, brings rusks to all the patients and medical staff waiting and working in the Haematology Department of Tygerberg Hospital where he works. He once asked her why she and her family did this thoughtful, compassionate thing. She told him that she had a son who was treated for leukemia a few years ago, and that, while tragically he died, she and her family remain grateful for the care that he received there. So they come every Wednesday and honour the young man that they so loved. Jacques tells me that her son, Piet, is a legend in the department; that stories are told of his courage and character, how he pimped up his hospital room, how he made people laugh, how he would write inspiring messages on paper aeroplanes and then float them out of his hospital room window. One of his friends made this video about him. It is beautiful, but unbearably sad. Watch it when you're feeling strong. So today, I will gather the courage and the strength to hold the fear and sadness of my mother who carries the disease and my father who loves her so much. And I will bake rusks. And remember the courage of those brave souls who went before; the Niccis and the Piets, and the Tannie Laurethas,and the Aunty Frankies and the Adriaans. And then I will phone my friend Didi, because 15 years ago she was diagnosed with breast cancer, and today she heals patients in her medical practice, she makes love to her husband, she holds her son in her arms and she laughs with her friends. Today the rusks I bake will be life-affirming. You have such a positive message in spite of your sadness & fear! Last year at the age of 36, I learned that one's mother will always be one's mother no matter your age or gender. This was on account of my mother dying suddenly. Dear Sam. I wish you much love during this difficult and heartbreaking and terrifying time. I admire that you are all going into battle with positive hearts and minds - that's always half the battle won. My sister-in-law's mother recently finished her chemo and is feeling and looking better and stronger than even before the cancer. Luckily she didn't suffer with too much nausea either, they say the new medications and treatments are much kinder on ones body. So again, much love for this very hard road ahead. I would love to meet in the park when you want to clear your head, or talk rubbish for a little bit. A little rubbish-talk is always restorative and lovely. Hi Sam, I don't know you ,but have been following and loving your column and now blog from the beginning. I am so sorry to hear about your mom.I know just how devastating such news can be as my own mom was diagnosed with asbestos mesothelioma(lung cancer) during February 2008 and given 3 months to live. It was first prescribed by a German scientist ,Dr Johanna Budwig during the 60's.She was nominated for the Nobel price for something like 5 time but never won (which is a hell of a lot better than most of us will every do. I don't know if it can cure cancer,but it does build up strength and it seems that you cope better with chemotherapy ,radiation etc.My mom's oncologist have been stunned time and time again by her recovery and that of other patients taking the "mix". I know it may sound like a bunch of hocus pocus en gryp na strooihalms ,but if you have time maybe google her. Thank you for these wonderful messages of support. i could never have imagined that cyberspace could bring such comfort. The world does seem so much kinder (and hopeful) because of of this. I'll pass on all these messages to my ma, who I know is probably now selecting just the right Hermes scarf for an occasion such as chemotherapy. She makes a glamorous, brave warrior. Liefde vir julle en jul geliefdes. ek is so jammer om hierdie post te lees, maar ook so bly om jou positiewe uitkyk te sien, en ja dit is die eerste stap na n positiewe uitkoms. Ek sal jou en jou ma en almal wat saam met julle hierdie geveg aanvat in my gedagtes hou. 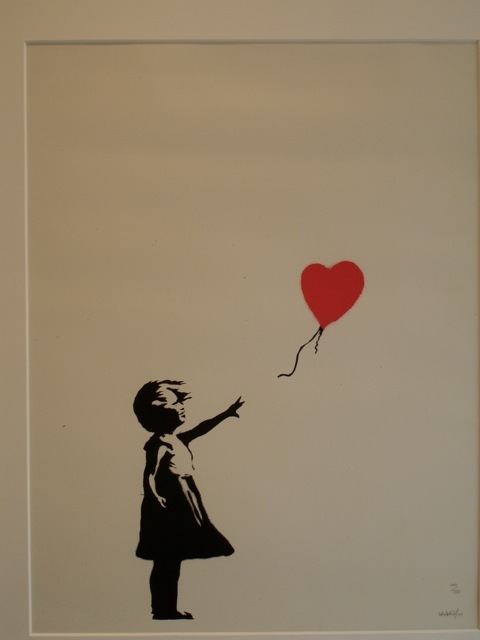 En soos daardie banksy image belowe; there is always hope! My liewe Ma het onlangs kom kuier...ons het mekaar ook al drie jaar laas gesien..en klomp stories gehad om te vertel...anyway, om ´n LANNG storie kort te knip...I came across your column in one of the TASTE mags she brought along. Actually, I feel like a naughty child, peeping through the keyhole to catch up on all that has been. So, today, I decided to write and catch up personally with a long-lost, wonderful old friend from Cape Town...I often still recall some of the hilarious times we spent together, from the times of pig tails right through to the trials and tribulations of Pol Wet at Stellenbosch, and the last time we met for a coffee in Cape Town in the pouring rain...at least 10 years ago!!! Ek hoop dat ons ons vriendskap weer kan vind...even if it has to be via cyberspace...I am just as technically challenged as ever...if not worse than before...so I really do hope that this messgae gets to you! Hoe ongelooflik wonderlik om van jou te hoor. Asseblief stuur vir my 'n vinnige epos na hungrywoman10@gmail.com sodat ek jou kan kontak en lang brief terugskryf. Jy het vanaand my hart so bly gemaak... Kan nie glo die kinders is al so oud nie - en so bly om te hoor dat dit goed (en opwindend) daar by jou gaan. Toe skryf gou, sodat ek jou kan kontak.